Clean rooms great location (golf next door!) 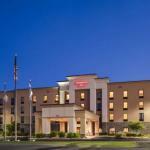 and a yummy free breakfast attract our guests to the Hampton Inn Branson-Branson Hills. Built in 2009 the four-story brick-and-stone hotel is stylishly furnished. The 89 rooms come with pillowtop mattresses and premium linens flat-panel LCD TVs work desks lapdesks coffeemakers and elegant bathrooms with granite-topped vanities and framed mirrors. Parking high-speed internet and breakfast are all included in the reasonable rate and breakfast is a treat with rotating items like eggs French toast and sausages. Night owls â?? and the always-available Bigelow tea and coffee in the lobby might create a few more â?? will appreciate the 24-hour business center and late hours of the indoor heated pool open till 11PM. There's a roomy gym to keep you in shape too. Golfers can practically tee off from the lobby thanks to the hotel's location right next to the Payne Stewart Golf Course. Bargain shoppers can stock up at Target TJ Maxx or Wal-Mart all one mile from the hotel. Continue three more miles to Historic Downtown Branson for a quainter shopping experience or to the Strip for dinner and a show. The airport is 13 miles away.